I'll get Revan and gear him eventually, but I think I'll stick with CLS for a bit. I actually prefer fighting Revans over mirror matches. They're more predictable. You say this like it's an actual achievement. Revan is a joke and so are the ones who need him to place in arena. Just my opinion though. Tbh, one who can place high would rather avoid the revan mirrors than field him. Yeah sure, you can choose to not hit other revans, but then you *are* indeed a joke. Agreed, my shard now has people cheesing to the top 20 with G9 Revan despite awful mods because they can take Traya/CLS without having a clue how to play. I climb through Revan all the time and haven't timed out or lost since I got my mods and kill order worked out in the first couple of weeks.It's not a straight mirror though because I use Hoda who works well on offence. Really? What happened to the complaints that it was too soon? Maybe those complaining and those content with it are not the same people? In what way it's too soon though, is it outside of CGs standart leg/hero release cadence? Its always too soon for the folks who drop a few hunded dollars to be super neato and totally makes up for being bullied in real life. It's also too soon for those who have actually built a team to deal with revan, eg traya badstilla. 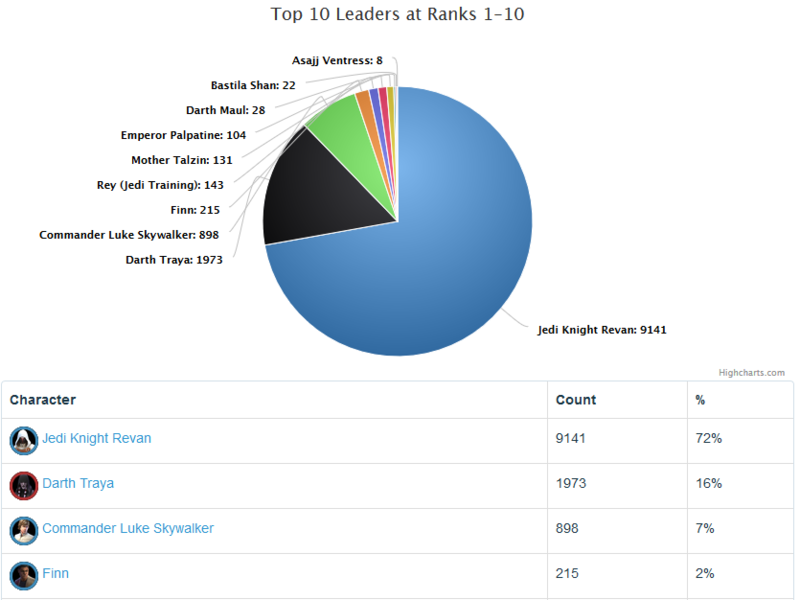 U do realise revan is a surefire way for total nubs to suddenly break top 10 overnight? They should change Jedi Knight Revan to Geico Revan, because he’s so easy a cave man can do it! But seriously, I’m not too worried about it. Sure it’ll hurt in the arena for a week or so, but once all the folks with terrible teams realize that they are loosing crystals with how many refreshes they have to do to climb back up it’ll chill for a while. I may have to level up my Jolee, though, so I can sub in Revan for Rebels while I’m on defense. Rebels are way more fun to play, but annoyingly get targeted way too much. We are at the place where Revan can elect himself prez. Top 10 increase has slowed down. Ding ding, we got a winner. Anyone remembers any such overwhelming meta? I've been through all, but I can't recall. And it lasted way longer than Revan will. There are already soft counters, and both the Droid meta and the Darth Revan teams are to enter the ring in the next 2-4 weeks. There are hard counters to Revan. Yes. I remember seeing top50 completely cls. Nothing else. For months. 76% in the top10 for a few weeks is noqhere even near. CLS meta was apparently much worse (didn’t play through it so just talking about what i’ve read on those forums), but Traya meta was up there too. The only difference is she was (and still remains) so hard to unlock compared to Revan. 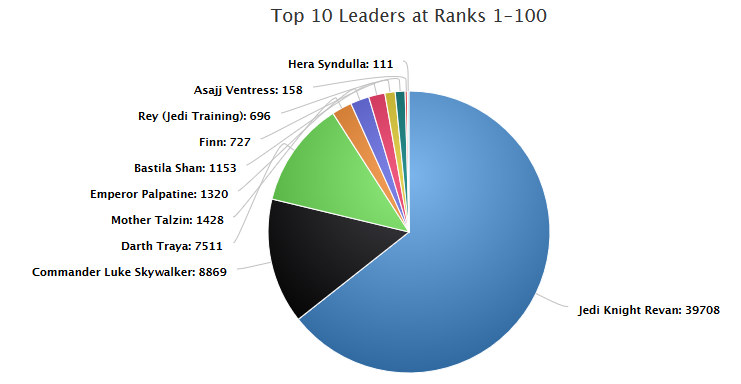 The only reason the numbers were not exactly the same for Traya this summer compared to Revan now : for top 100, a lot of people didn’t have her; for top 10, a lot of younger shards didn’t have her. So overall, from CLS to now, i’d say all metas were the same in a way. Only jtr was different because she was less dominant and her meta lasted like 45min, and palp because he was only a step toward traya. I think the way things work in this game, any new paywalled meta will probably show the same numbers as long as it is accessible, like legendary/journey based. I think a team (at a given timeline) to be truly op and becoming domineering statistically are two different things. So it all hinges on the release method and time period. 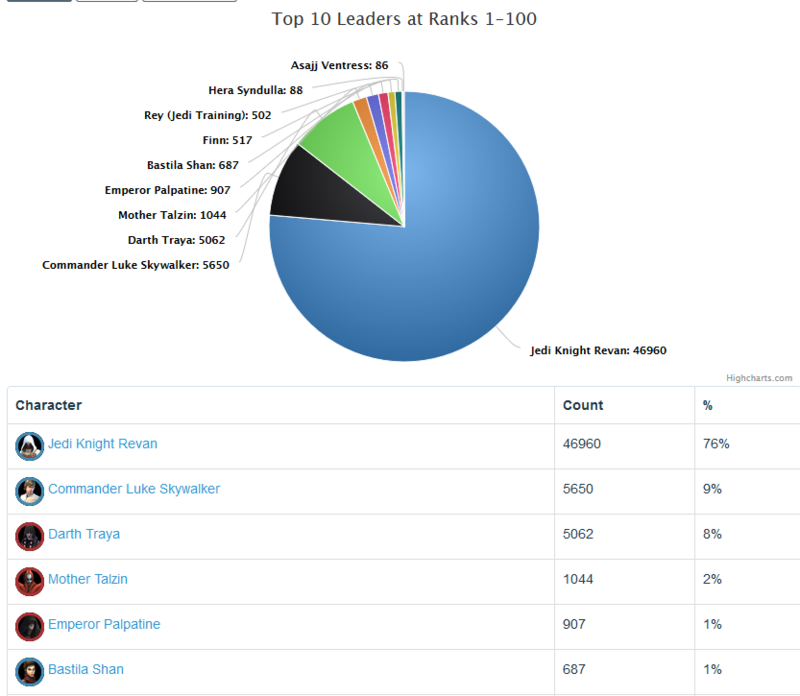 I also think Revan was over the top compared to previous meta drives and the level of power creep. For example was +5 speed really necessary for him to accomplish CGs goals with this release? He would have been meta killer with less. Little bits like this keep adding up in the long term making it harder to design characters while keeping everyone's previous investments intact. The next thing will kill Revan, ok, rinse&repeat. I do however wonder if we'll be able to get back to the times where 4-5 metas can decently (and statistically) co-exist. -Make the meta op enough that it is basically a sure pay to win button, to make sure anyone who would want to invest would see immediate and spectacular results. For example in my shard, people from the 200-500 range climbed as high as top 20 with sub optimal teams and absolute garbage mods. 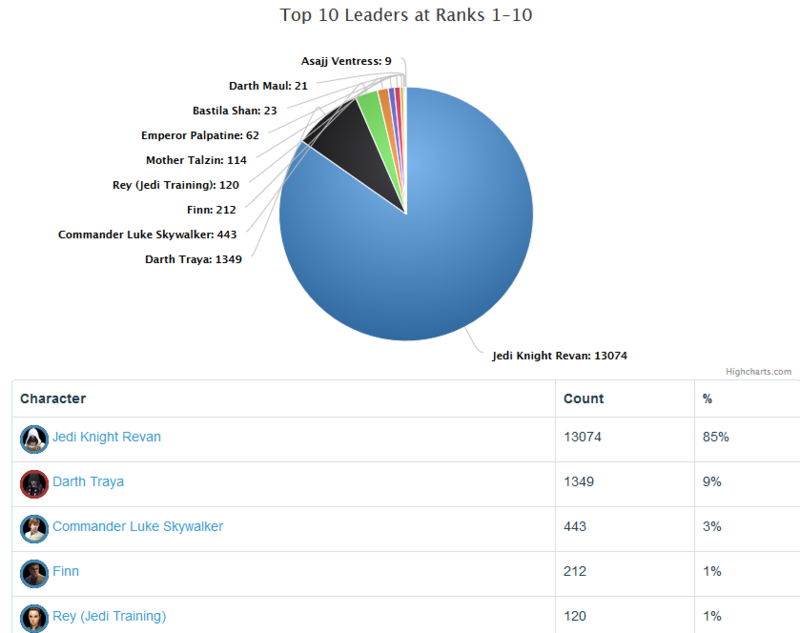 Had Revan been just strong enough to overtake Traya, they would never have been to do that, and would have been disappointed to see little change compared to the investment. I don’t feel it’s a sustainable way to do things and wonder how they are going to manage in the future. It will be interesting to see how Revan’s successor is built. Sheer power like Revan himself won’t be possible, the team would be too close to unbeatable. Specific anti-faction are a solution, but not a sustainable one i feel. Yeah and even so shard chats quickly adapted. 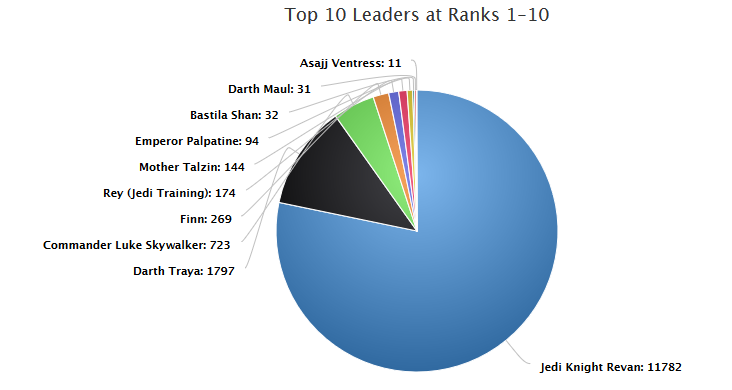 After a week of the release the top 20 was mostly the same Revan or no Revan. 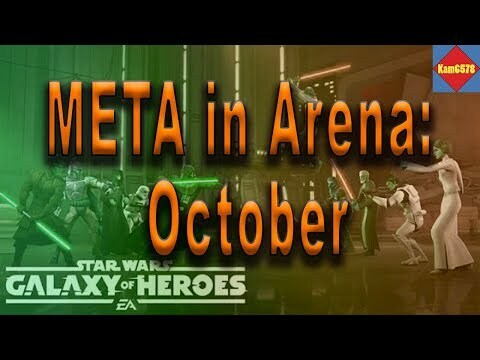 I think the ideal for upcoming metas is to disrupt the current meta, but also be susceptible to some of the previous ones or a non-meta team at it's release time. That's what I see as a -shake up-, rather than a -write off-. Not claiming what kind of design would establish that though xD. I guess Revan will keep coming back after it's prime just like Cls did for the same reasons it did. So long as next ‘anti jedi’ meta has an obvious weakness to another faction, balance can easily be restored. historically speaking, it's more likely that the next meta is going to be rather exclusive instead of being very beatable by another faction, but beatable on offense by another faction nontheless. I expect it to be beatable by Traya and CLS at least to some degree, it would take an awful lot of power creep to make those teams completely obsolete. Especially if it's specifically the anti-Jedi team meant to eat Revans for breakfast but not that efficient generally (not sure how would they pull that off, though). I was predicting %80 before the next meta hits, but GG may offset that. Also, by the time CLS came back the second time, JTR had come out. She took a huge chunk out of CLS and the meta was more even between them. 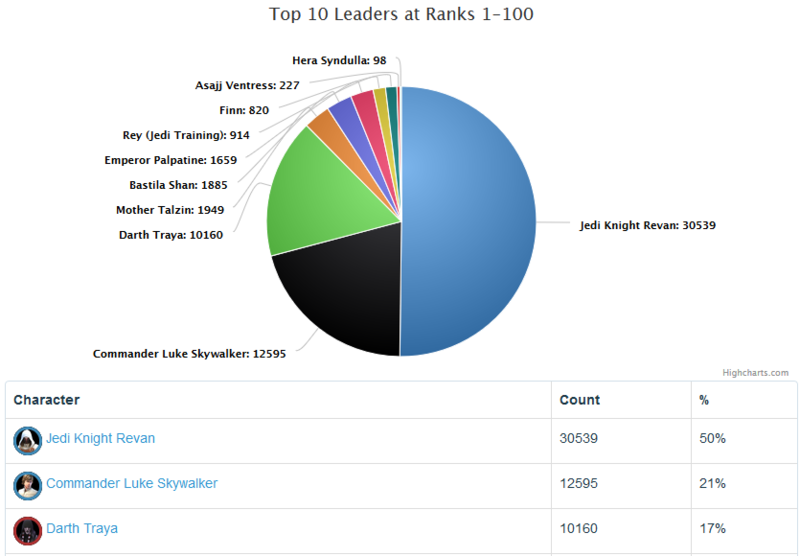 Revan came back a second time and he's still king. It's why this one is worse than CLS. Thanks, we are past that point in 1&10 already. 100 is catching up slower as that consists more of players taking their time to get ready. Yup, it's pretty wild. I wish we could see the old meta reports, I'm glad Kam did this series during the height of CLS. I'm also glad you are doing it during the height of Revan. 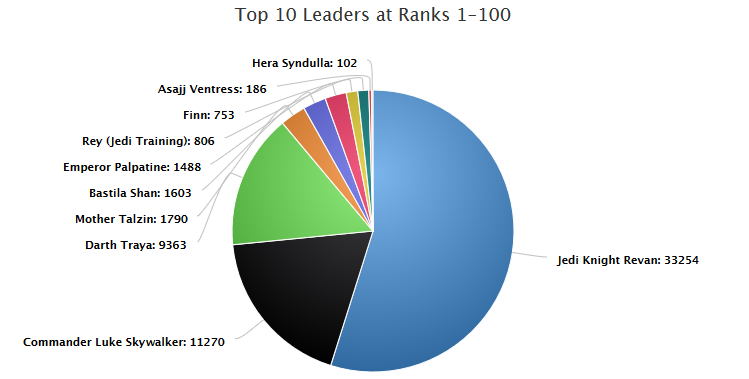 By January 2018, JTR had taken the top spot from CLS and was about 40%. 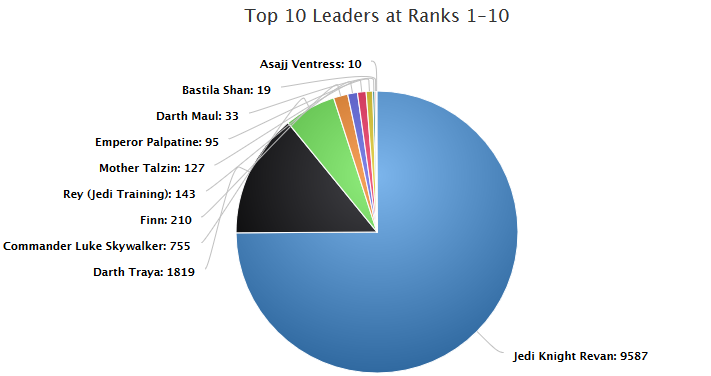 If JTR had not come out before CLS's second run, CLS would have probably been about the same as Revan is now. Top 10 seems close to saturation point, 100 has a long way to go still. It very well can. I've had plenty of timeouts. Quite a lot of the beginners. By the nature of being a beginner most of them don't use swgoh.gg but if they did as much as the veterans we'd see a nice chunk of phoenix's in the list. The thing is, If this didn't include new shards that have Nightsisters and Phoenix dominating them, then that's a lot of MT's, Asajj's, Hera's this would remove, making Revan stand out even more, lol. Top 50 all reven exact same team! Very boring.. Right before GG changes hit (which I doubt will bring any statistical meta shake) we are really heading for %80 in top 100 hehe.